This post is sponsored by Stonyfield Yogurt and King Arthur Flour. I only eat scones in coffee shops, or when I'm having afternoon tea. (I write that like I have afternoon tea all the time, I don't - only the occasional baby shower.) I prefer them to muffins, because they feel a bit more substantial. I have never even thought to make them home, until recently. 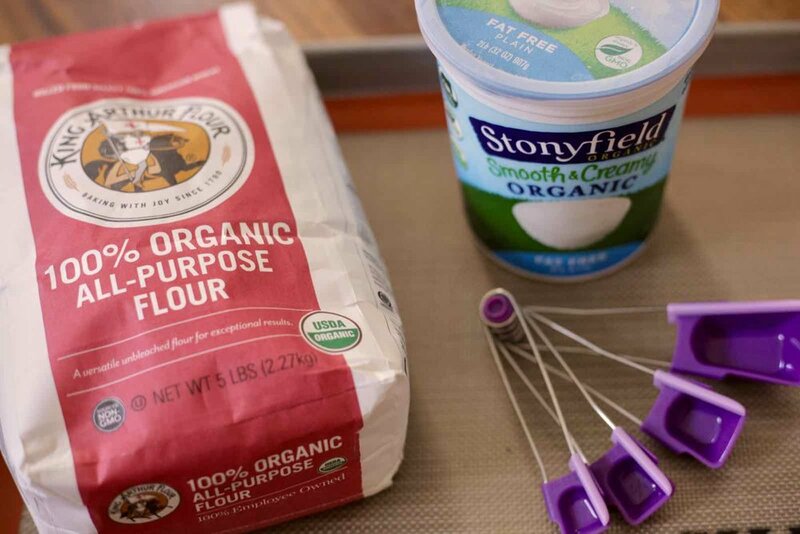 When Stonyfield sent me some baking materials (a Silpat and Levoons) for this month's King Arthur Flour post I thought about what I would want to nibble on in the weeks before the Holidays. I feel like we will be swimming in cookies and cake once the parties start. Cranberry Scones sounded like a great idea, since they're Christmas-colored. With a natural sweetener, Sucanat (see recipe below for sugar substitute). This is my first time actually using my marble pastry slab to make pastry. Although, are scones a bread or a pastry? At any rate, usually I just haul it around the house as a background for pretty photos. Today I'm kneading and rolling away on it. The Silicone Baking Mat is something I've wanted for a long time. I bought a cheaper version a while ago, and made the mistake of cutting a pizza on it. Don't do that. Very happy to report that my first scone adventure is a huge success! They're firm on the outside and soft in the middle, and not too sweet. Abe said they were better than Starbucks, which is a huge compliment considering we used to go there not for the coffee, but scones. Combine the dry ingredients in one bowl. Add the butter and use your fingers to work it into crumbs. Stir in the cranberries. In another bowl, combine the wet ingredients (everything else but the Almond Milk). Add everything in this bowl to the dry ingredients, creating a sticky dough. On a floured surface, gently work the dough into a circle. Cut the dough (like a pie) into triangles. 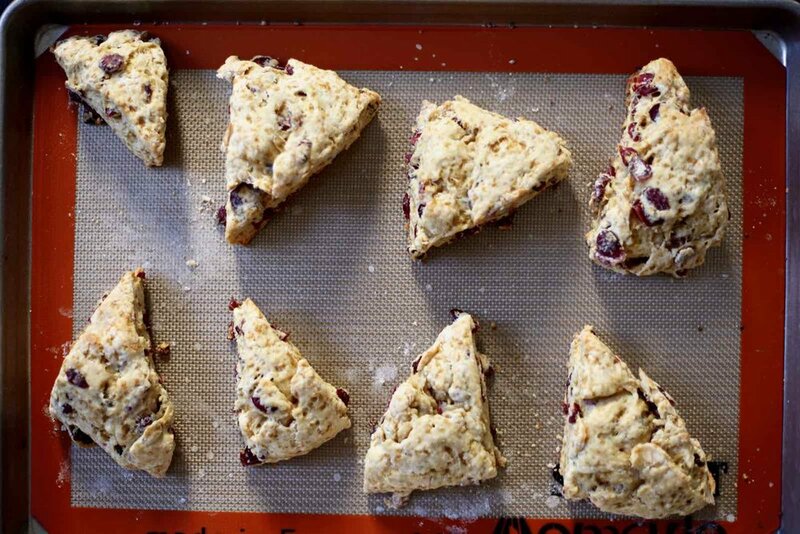 Place the triangles on a Silpat or Parchment lined baking sheet. Brush with the Milk. Bake for 20-25 minutes until a toothpick comes out clean. Store at room temperature in an air-tight container for several days, or wrap and freeze.